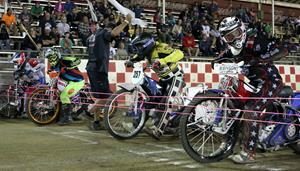 Speedway racing continues to heat up at Auburn’s Fast Friday’s Motorcycle Speedway as championship speedway racing got underway last Friday September 22 at the Gold Country Fairgrounds. Championship programs in Division I, Division II and Division III were hosted. Along with the division championships the final round of the very popular Team SOS-Team Challenge wrapped up with the challenge championship. 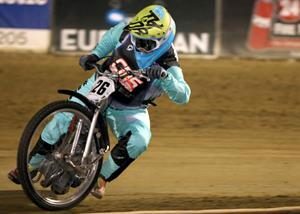 All season long current AMA USA Speedway National Champion Billy Janniro has led Division I in the points standings and finished the regular season with the most points, ahead of Bart Bast by 99 points. The top 16 Division I points riders during the season qualified for the championship. Riders squared off in 20 scratch races keeping score with 3 points for a win, 2 points for a second place finish, 1 point for a third place finish and zero points for a fourth place finish. Winner with the most points at the end of the evening would become the 2018 Fast Fridays Track Championship. 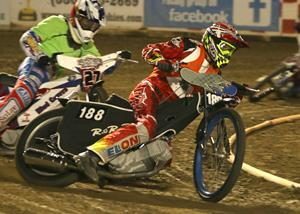 Riding in one of his best nights of racing Russell Green had a fantastic night dropping just two points off Janniro’s perfect night for second place. Green placed second to Janniro in round three and in arguable one the best races of the night finished second in round five to Danny Faria. Bart Bast finished the evening with 12 points dropping one point to Janniro, Charlie Venegas and Green and finishing third. Will McCloskey, who also finished as the top Division II season point’s leader by just four points over Shawn Eldredge, won the Division II track championship. The championship format was a little different for Division II & III. 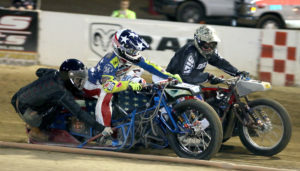 Riders rode in one of two scratch heat races with the first and second place finishers transferring to the main. The winner of the main would be the track champion. McCloskey faced Shawn Eldredge, Matt King and Aaron Sorani in the main. McCloskey won his heat and then the main for the championship. 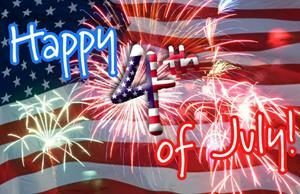 “It’s been a real good year, consistent. I can’t thank my Dad enough for his help and all my sponsors,” said McCloskey. Eldredge was second, King third and Sorani was fourth. 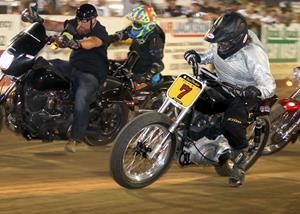 In the sixth and final round of the Team SOS-Team Challenge Rocklin Harley Davidson held onto their lead from round five to win the inaugural team challenge event over Team SOS. Rocklin Harley Davidson led Team SOS 51-42 after round five. Janniro and Venegas scored win for Rocklin HD and Bast scored a win and three points for Team SOS. The final score was 62-49. 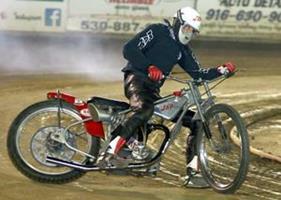 The series ran through the season as teams rode three heats each round picking up points for their finishing order. The teams competed for a total purse of $4,000. 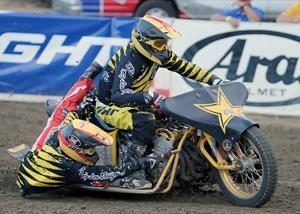 Saturday night Fast Fridays will host the fifth and final round of the AMA USA Speedway National Championship. 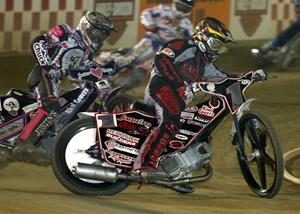 Janniro is the heavy favorite and should he win he will become the only American speedway rider to win nine national championships. This is racing though and anything can happen and Janniro will have to be riding his best to make history. Division II Main-The start of the Division II main event for the championship. Will McCloskey (right) won the race and the championship. Also in the main event were (left-right) Aaron Sorani, Matt King, and Shawn Eldredge. Estes-Jake Estes holds his trophy high after winning the Division III championship and celebrating with the Fast Fridays trophy girls. Estes-Jake Estes on his first track championship in Division III. Janniro-Billy Janniro picked up the Division I 2018 Fast Fridays Track Championship. 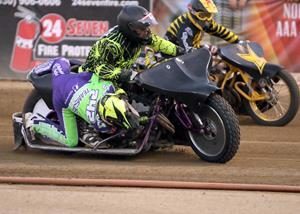 McCloskey-Will McCloskey won the Division II track championship at Fast Fridays Motorcycle Speedway Saturday night in Auburn. Mersaroli-Louie Mersaroli was part of the Rocklin Harley Davidson team that won the season long Team SOS-Team Challenge competition of six rounds of team racing. 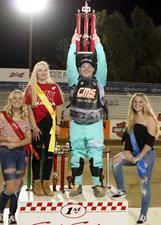 Winners Podium-Celebrating the 2018 Division I Fast Fridays Motorcycle Speedway track championship are Billy Janniro-winner (center), Russell Green-second place (left) and Bart Bast-third place (right). Jake Estes on his first track championship in Division III. Jake Estes holds his trophy high after winning the Division III championship and celebrating with the Fast Fridays trophy girls. -Billy Janniro picked up the Division I 2018 Fast Fridays Track Championship. 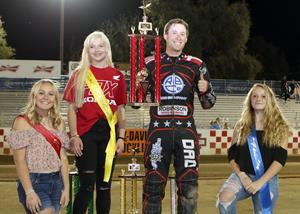 Will McCloskey won the Division II track championship at Fast Fridays Motorcycle Speedway Saturday night in Auburn. 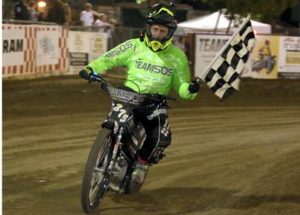 Louie Mersaroli was part of the Rocklin Harley Davidson team that won the season long Team SOS-Team Challenge competition of six rounds of team racing. 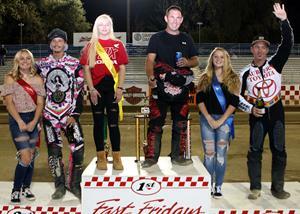 Celebrating the 2018 Division I Fast Fridays Motorcycle Speedway track championship are Billy Janniro-winner (center), Russell Green-second place (left) and Bart Bast-third place (right).